What do you get when you add 1,000 yards of offense and 84 points? For one, a pretty long high-school football game. But more importantly Friday at Watson Stadium in Hobbs, the sum total was a win for the Bulldog football team in their first road game of the 2016 season and another opportunity to grow as they had into the meat of their regular-season slate. “We’re really pleased with the effort that we got out of our young men last night,” Artesia coach Rex Henderson said Saturday. “We felt like they really competed well and stepped up to take on a challenge. The first quarter was also nearly a game in and of itself. 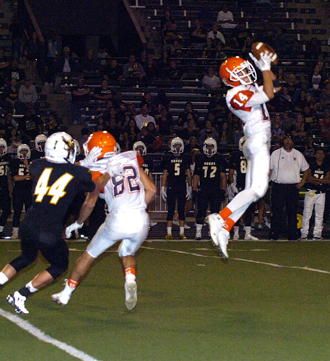 Stretching on for 50 minutes, the opening period saw Artesia score to cap its first four drives and establish a commanding 29-7 lead as the defense forced a pair of punts and a turnover. The ‘Dogs covered 93 yards in seven plays and a little over three minutes to start the game Friday, taking more than half the field in one fell swoop on a 53-yard touchdown pass from Taylor Null to Ethan Duff. After an Eagle three-and-out, the offense would do themselves one better, making it 14-0 on a 90-yard catch-and-run from Null to Kameron Aguilar. An illegal block call on the Bulldogs set Hobbs up near midfield on their second series of the night, and the boys in black and gold were able to get on the board with a four-yard pass from junior QB Gavin Hardison to Alec Finney with 6:38 on the clock. But the ‘Dogs weren’t about to slow their pace, scoring again on a six-yard toss from Null to a leaping Chaney Hardt in the end zone to go up 22-7 with 4:52 still remaining in the first. Another forced punt gave the Big Orange offense the ball back with plenty of time for another strike. They needed only a matter of seconds, as Null found Duff again, this time for a 72-yard score that made it 29-7 with 2:59 to go. Artesia had a shot at an incredible fifth first-quarter TD after a bad snap by the Eagles was snapped up by linebacker Bon Eric Trujillo. The ‘Dogs would turn the ball over on downs, however, and Hobbs embarked on its second scoring drive of the night as the opening 12 finally gave way to the second quarter. 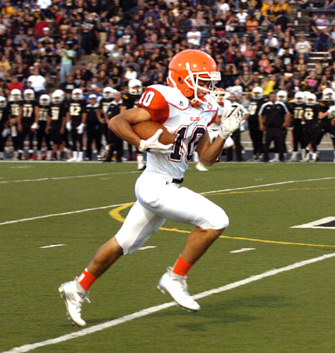 A one-yard plunge over the goal line by Tristan Kemp brought the Eagles back within 15, but after recovering an onside kick at the Hobbs 39-yard line, Artesia answered in short order on a 29-yard sprint to the end zone by senior running back Isaiah Weideman. The two squads traded punts before the Eagles were able to put together another successful drive, culminating in a four-yard pass from Hardison to Finney. And the Hobbs Homecoming crowd remained on its feet as the Eagles recovered a second onside attempt at the Bulldog 38. Hardison quickly propelled his offense to a first and goal at the Artesia four, but following an incomplete pass and an illegal procedure made that second down at the nine, the Orange Crush stiffened to force the turnover on downs. On top 36-21 at the break, the ‘Dogs kept the pedal down in the second half. 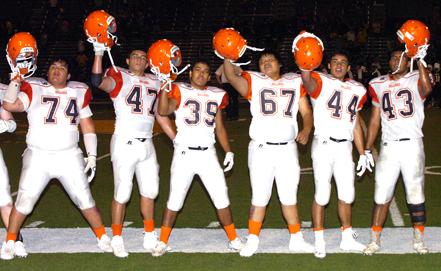 Finding success in the running game in their lone drive of the third quarter, Artesia stuck with it, converting twice on third down and once on fourth, and – as an added bonus – keeping the clock moving. Weideman would punch it in from the six-yard line to cap the series, making it 42-21 ‘Dogs with 3:49 to go in the period. 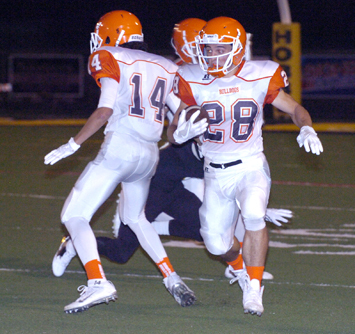 After the Eagles’ second punt of the third, Artesia carried another lengthy drive into the fourth, turning to Weideman again from the two for their seventh touchdown of the game with 9:08 remaining. Hobbs was able to use a big kick return and a 32-yard pass from Hardison to Michael Chavez on third and 15 to set up their final score of the night, a four-yard pitch from Hardison to Cason Clay at the 8:08 mark. The ‘Dogs rounded out the final in an eight-play, 65-yard drive that saw Weideman and Robert Fernandez doing the leg work en route to a four-yard push by Fernandez. 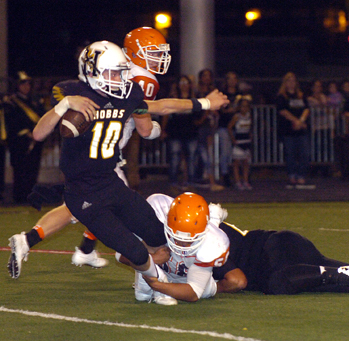 Hobbs appeared poised for a token score as the final minutes ticked away with a first down at the Artesia one. But a tackle for a loss of four bumped them back to the five, and Eddie Pando would recover the Eagles’ second fumble of the night to seal the deal. “I thought our defense did a great job against a pretty explosive offense,” Henderson said. “For them to run as many plays as they did and only get four touchdowns was something we were pleased with. The Bulldogs finished with a whopping 596 total yards of offense on the night, 387 through the air and 209 on the ground. Null accounted for all 387 passing yards, completing 20 of 33 passes and logging four touchdowns. Duff (7-190) and Aguilar (3-103) led the receiving corps, and Weideman and Fernandez finished 9-91 and 13-48 rushing respectively. 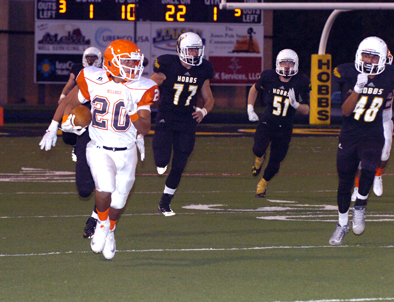 Hobbs posted 411 yards of its own, making the 28-point total a coup for the Crush. The Bulldogs (2-0) will now prepare for their longest road trip of the regular season Friday when they had to Los Lunas to take on Valencia. 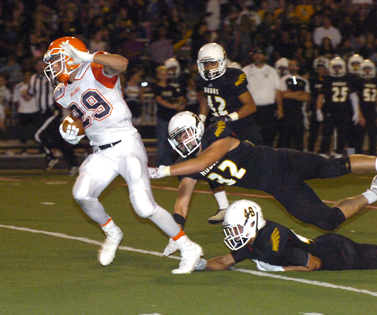 The Jaguars are 0-2 on the year after falling to Alamogordo 35-0 Aug. 26 and Albuquerque High 37-6 Friday.